The Kids vs Goblins art book gives a behind the scenes look at how Stolen Couch Games created the game. With more than 40 pages of high resolution concept art, videos and interactive 3d models the Kids vs Goblins art book gives you a perspective of how it is to be an artist at Stolen Couch Games. 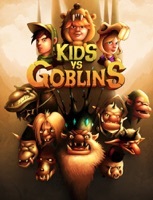 And best of all: The Kids vs Goblins art book is completely free.